Richmond Food Co-op Comes to South Side | News and Features | Style Weekly - Richmond, VA local news, arts, and events. Scott Elmquist Richmond Food Co-op board chair David King and architect Patrick Farley hold renderings of plans to turn the site at 1200 Westover Hills Blvd. into Richmond's only cooperative grocery store. Like an oasis in a food desert, residents of Westover Hills see a grocery story on the horizon. Not two seconds after Richmond Food Co-op board chair David King unlocks the dusty garage door, a man drives up to ask what’s going into the former thrift store at 1200 Westover Hills Blvd. Carved out of a building that once held a Safeway, the 5,600 square foot space next to a Family Dollar store will soon bring groceries to the intersection of Westover Hills and Forest Hill Ave. -- the only source in a mile-and-a-half radius and one of many neighborhoods in Richmond without one. After a membership drive stretching back to 2012, the co-op surpassed the 1,000 needed to sustain operations. Scott’s Addition was the first choice for a location, but King says they were priced out. “We did a survey of our membership of where they’d be willing to have us move that’s not Scott’s Addition, and this came up as number one or two,” he says. In December, the co-op signed a five-year lease on the Westover Hills space, which has been vacant for around three years, and they begin renovations in June. The grand opening is planned for the fall. King adds that some members were disappointed with the move across the James River, but he hopes the chosen location will help the co-op fulfill its mission. It seeks to promote a healthy lifestyle and provide access to good food in a location that’s challenged, he says. Membership costs $125 per adult. People who qualify for food stamps or WIC benefits can pay $10 to join. The co-op is collecting new members in the neighborhood and will launch a $1.7 million renovation campaign soon. Around half of that will come from loans from participants and the rest in bank loans and grants. 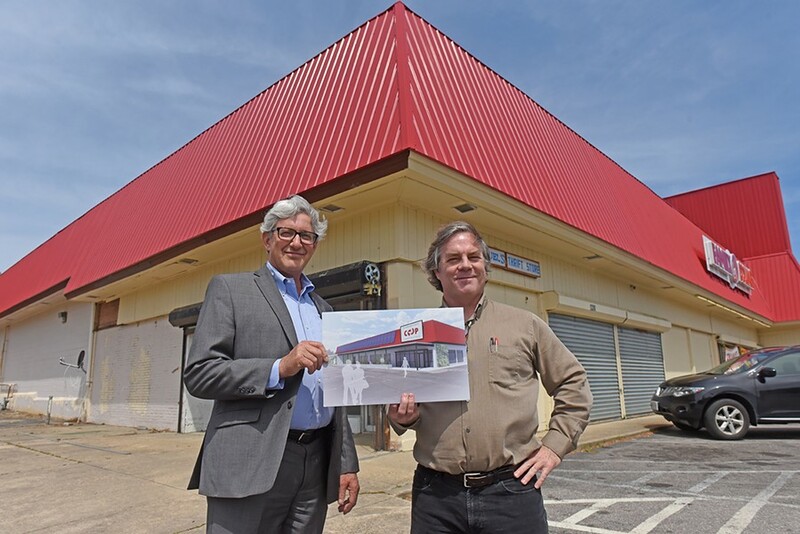 Farley and King are open to the possibility of expansion -- into Family Dollar if it leaves or into other locations -- but are focused on this space for now. He stops to explain to a passerby how a co-op works: Members own equity in the store and receive dividends when the store is profitable. But you don’t have to be a member to buy groceries there. “I always make a point to clarify that,” Farley says. Editor's Note: An earlier version of this article said membership dues are annual. They are one-time only.